Ms. Baker takes this document and compares it to an FBI report completed on November 29, 1963 by FBI Agent Robert C. Lish. She claims that the FBI typed over the document changing the time from 1:15 to 1:25. The document that she cites to make this claim is a report filed by Special Agent Robert C. Lish. on November 29, 1963. 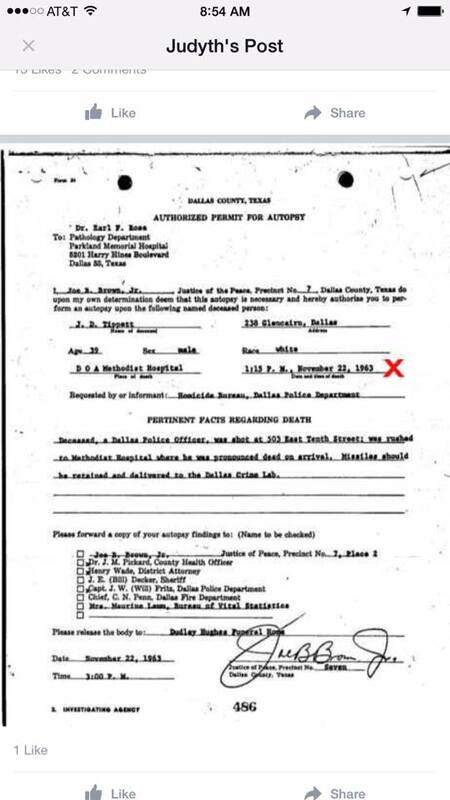 This document indicates that JD Tippit was pronounced dead at 1:25 PM. SA Lish is reporting on the paperwork on Officer Tippit in possession of the Dudley Funeral Home. The report shows that Officer Tippet was pronounced dead by Dr. Liguori at 1:25 PM. So what explains the discrepancy? Going back to the first document, the 1:15 would demonstrate the time of arrival based on the way autopsy request is written. It does not indicate is the time he was pronounced dead. What happens when a person is brought into a hospital? The doctors in the emergency room very often take measures to revive the person who is laying before them on the table. They do not pronounce the patient dead and then begin life saving measures. As a matter of fact, one would imagine that in 1963 there would have been as much a sense of urgency to save a police officer as there was to save President Kennedy. Is there evidence that this took place? Keeping in mind that these times, are not on the synchronized atomic clocks that work with our cell phones. There is the potential for differences in the timeline but it is a finite twenty minute timeline in length. The point is yet again, Ms. Baker is taking liberties with historical documents to make a hypothesis that would have involved many moving parts. 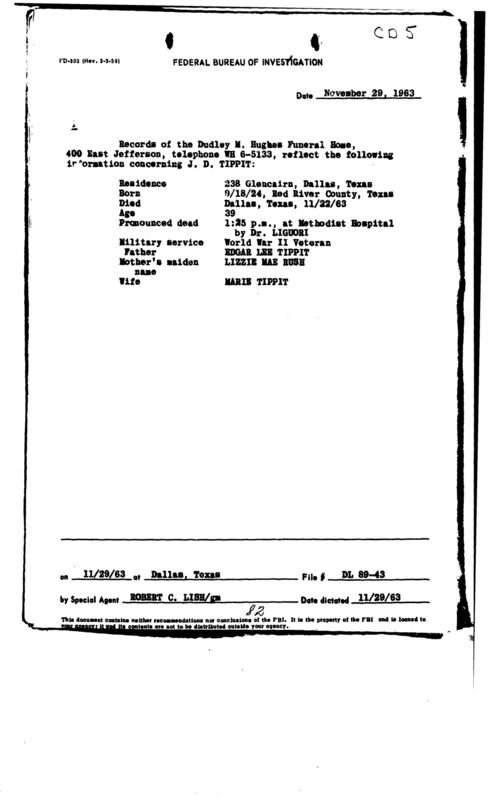 The Dallas police reports would have had to have been doctored, since Officer Tippit’s murder would have been under their jurisdiction and this would have to align with the FBI reports, the hospital documents, the funeral home documents and every individual report filed by a police officer. Judge Brown and Dr. Ligouri would have had to have been complicit in this as well as the police officers who were in the emergency room with Tippit. To support her hypothesis there would be too many moving parts to sustain it. The timeline presented here works and makes sense. Once again, the Baker Oswald Mythology is not sustainable with this evidence that supports a reasonable explanation. (2) Rose, Earl F. [Autopsy Report on Officer J. D. Tippit, by Earl F. Rose #2], Legal Document, November 22, 1963; (http://texashistory.unt.edu/ark:/67531/metapth338334/ : accessed September 05, 2015), University of North Texas Libraries, The Portal to Texas History, http://texashistory.unt.edu; crediting Dallas Municipal Archives , Dallas, Texas. 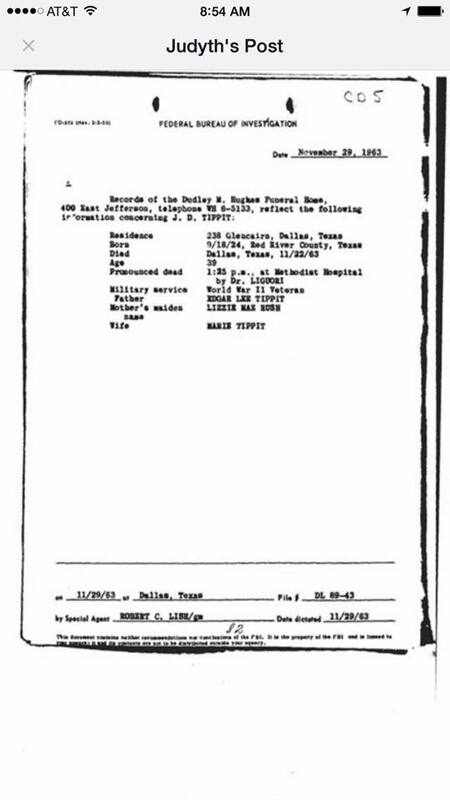 (3) Rose, Earl F. [Autopsy Report on Officer J. D. Tippit, by Earl F. Rose #2], Legal Document, November 22, 1963; (http://texashistory.unt.edu/ark:/67531/metapth338334/ : accessed September 05, 2015), University of North Texas Libraries, The Portal to Texas History, http://texashistory.unt.edu; crediting Dallas Municipal Archives , Dallas, Texas. (5) Dallas (Tex.). Police Dept. 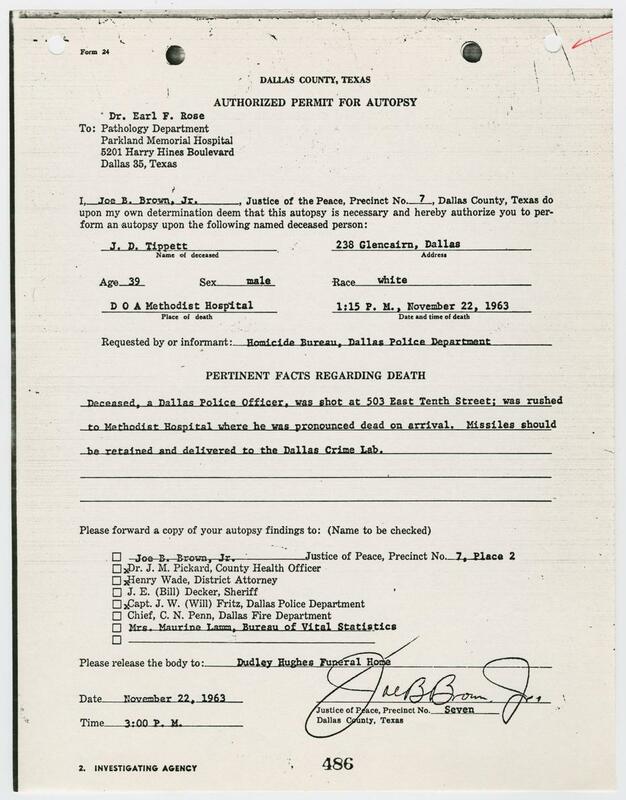 [Supplementary Offense Report Concerning Shooting of Officer Tippit #5], Text, 196u; (http://texashistory.unt.edu/ark:/67531/metapth338270/ : accessed September 05, 2015), University of North Texas Libraries, The Portal to Texas History, http://texashistory.unt.edu; crediting Dallas Municipal Archives , Dallas, Texas. What Baker does not point out is that the report also was open to the possibility that there was human intelligence shared between the FBI and the CIA about the dates. The report continues by stating that it does not really matter how the information was acquired by the CIA, but that it does mean that CIA headquarters was possibly aware of these visits prior to the assassination. This article supports their conclusion. The Lopez report does not indicate that the CIA knew about the visit prior to the actual visits as Baker leads her followers to believe. Baker, leaving out the fact that the Lopez report was open to other investigative means to determine the September 27, 1963 date is the perfect example of how a little truth being excluded can support the myth. (3) The next page of the Lopez Report addresses this issue further stating that there were cables to headquarters that contained information that linked Oswald’s October 1 phone call to a visit to the phone call from the Cuban Embassy to the Russian Embassy on September 28. (4) The knowledge of these cables alone could have been the reason Birch O’Neil expanded the search. This hypothesis does not hold true when looking at the evidence. The answer to how Birch O’Neil knew to expand the search to September 27 will be explained as we consider other sources of information. The CIA had other sources and methods connected to famed mole hunter James Jesus Angleton. LIOVAL-1 was managed by Paul Dillon. (14) Dillon was in charge of many aspects of operations involving the Soviet Union including defector Yuri Nosenko. Based on the recruitment attempt of Yastikov and the defection of Nosenko, there is little doubt that Paul Dillon worked with Angleton. (15) Angleton (Pseudonym Kingsman) was immediately involved on November 22 in communication with Mexico City. Angleton had transcripts of phone calls made by Luisa Calderone, a Cuban Embassy Employee who was caught on the wiretap joking about the Kennedy Assassination on November 22 saying, “I knew about it before Kennedy.”(16) . The interesting thing about these transcripts to Angleton is that there does not appear to be a record of cable traffic to document it, just a hand written note. (17) Either Angleton was in Mexico City and it was handed to him or there appears to be a backdoor channel by which information was sent to Angleton directly because there is no evidence that this was sent to Angleton through cable traffic. If the transcripts were sent out through cable traffic, why did they not send the transcript directly to JC King (Galbond) directly? This note leads one to believe that this was filtered top down according to this from Angleton down to King. Additionally, the handwritten note specifically states that they were not yet sharing this information with the FBI, indicating that they were protecting their source, HTLINGUAL. Two logical hypothesis that can be produced from this information. One hypothesis is that it was practice to send transcripts to Angleton on Soviet targets, possibly though backdoor channels. Another hypotheseis is that LIOVAL-1 could very well have provided information prior to the assassination about the visit from one of his fishing trips with Yastikov. The transcript hypothesis make more sense, as it was clear they were trying to figure out who the man was that visited the Cubans and Soviets on September 27th. A review at HQ by Angleton’s staff would have helped to widen the focus of the investigation. The Lopez Report is open to this as has been pointed out above. However, there is a more likely hypothesis that needs to be explored. While plausible, these two hypothesis lack a sound basis in evidence. The most plausible hypothesis is that there was another source of information which interestingly enough, turns out to be Lee Harvey Oswald himself. Baker asserts that the CIA was framing Oswald with a meeting with Kostikov. (18) As you will see, Oswald himself ties himself to Kostikov, without the help of the CIA. 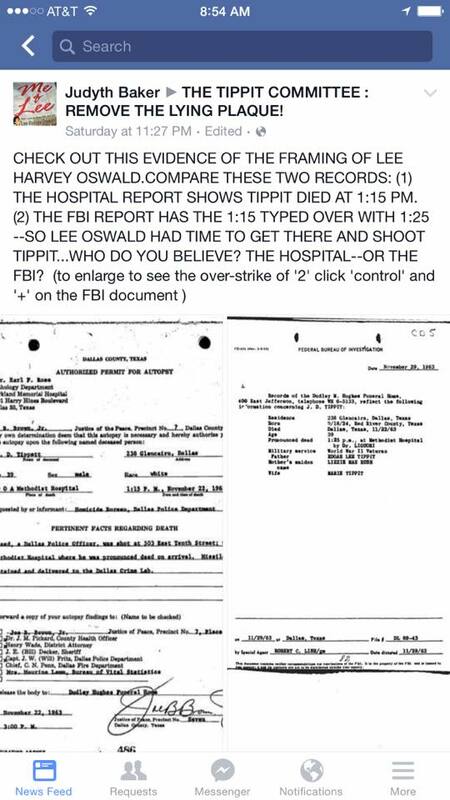 All of the evidence above and the investigation by LIOVAL-1 does not point to anyone framing Oswald. It points to the CIA painstakingly trying to figure out what happened inside of the Soviet Embassy into mid 1964. This was done even at the risk of compromising the relationship between LIOVAL-1 and Yastikov as written about by Nechiporenko. The CIA tried desperately to figure out if it was Kostikov. Is this the behavior of an organization trying to frame Oswald, or is it the behavior by the CIA desperately trying to determine if the Soviet Union was behind the assassination? Oswald wrote to the Soviet Embassy in Washington DC in early November about his meeting with Kostikov. He wrote about his dislike for the Cuban Consulate Azcue who went back to Cuba after Oswald’s visit and wrote with praise for the people inside of the Soviet Embassy. This letter demolishes the Oswald Myth created by Baker. First, if Oswald was on an aborted mission, and did everything he could in Mexico City to get to Cuba there was no reason to write the Soviet Embassy because the mission was over. (19) Most important however, is the fact that there is no reason to frame Oswald with anything, he identified meeting with “Kostin” (Kostikov) in his letter. Baker’s Oswald Mythology continues to fall apart. So the question becomes did the CIA know about this letter? The CIA HTLINGUAL program was a mail opening program that was run out of the office of James Jesus Angleton. Oswald was on the list for mail opening since his attempt to defect to the Soviet Union. (20) He stayed on the list for nine months. (21) However, they were still intercepting mail going into the Soviet Embassy in DC. As is indicated in the House Select Committee on Assassinations investigation, these intercepts would not have been stored in any persons 201 file due to the secrecy of the program. As of November 26, Angleton himself had reviewed an FBI report and through HTLINGUAL sources informed J. Edgar Hoover that Oswald had used the name “Alik” and that this may be “significant” in relation to the Alex Hidell name associated with Oswald. (22) The most logical conclusion is that in addition to providing the FBI with the information about Oswald’s nickname to the FBI, the information gained from HTLINGUAL determined to expand the search for information in Mexico City to September 27, 1963. Is there evidence that the HTLINGUAL program intercepted the Oswald letter? The FBI had decided in 1958 to speak to the post office about starting a letter opening program. They were informed that they were a little late, that the CIA already had one operating. (23) One can only wonder how Hoover reacted to find that the CIA was conducting a domestic operation on American citizens. What we do know, is that the FBI was receiving information from this program. The FBI had a typed copy of Oswald’s letter and had distributed the letter to the FBI Office in Dallas TX. prior to the assassination. (24) James Hosty writes in his book, Assignment Oswald, that it was part of the Oswald file, and that he did not have the ability to question the Oswald’s about it because it would have revealed the mail opening program to the Oswalds. 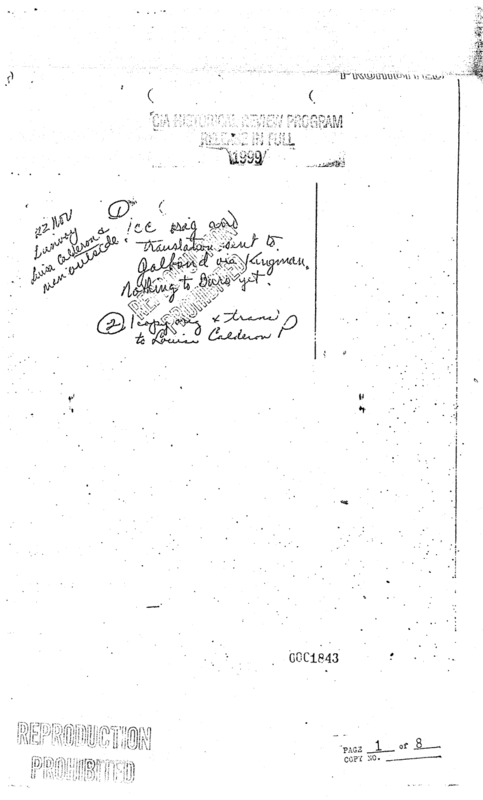 (25) On November 23, Hosty acquired a hand written rough draft written by Oswald from the Paine residence. (26) In addition to this, the Soviet Ambassador provided the state department with the letter itself on November 30. (27) The signature on the typed letter demonstrates that Oswald signed the letter himself. The letter would become part of the Warren Report as CE-315. Without a doubt, the CIA and FBI must have enjoyed the fact that they no longer had to protect the HTLINGUAL source because of this information from the Soviets. 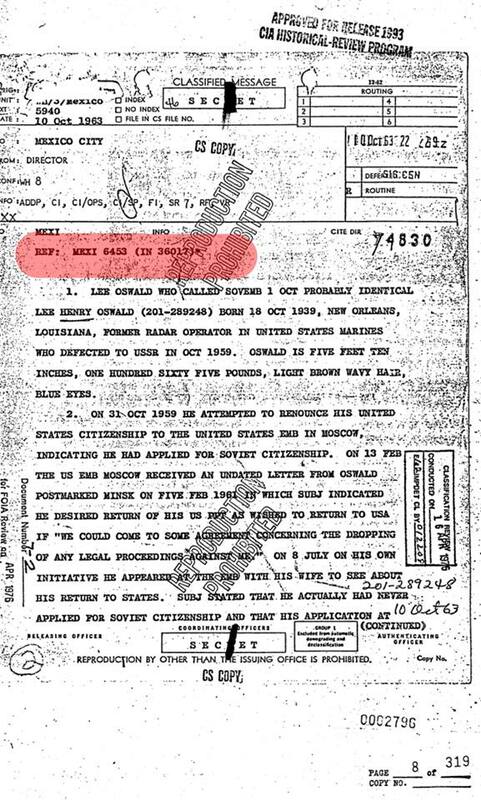 What this does mean is that James Angleton upon reading the letter in his files, knew instantly that Oswald had visited the Cuban Embassy prior to his visit to the Soviet Embassy. It is entirely logical that Angleton would then expand the known day that the Oswald cable of October 8, 1963 indicated the visit of Saturday, September 28th to Friday, September 27th as the Cuban Consulate was traditionally closed on Saturday. Birch O’Neil, Angleton’s right hand man, sent the cable that widened the search by a day. 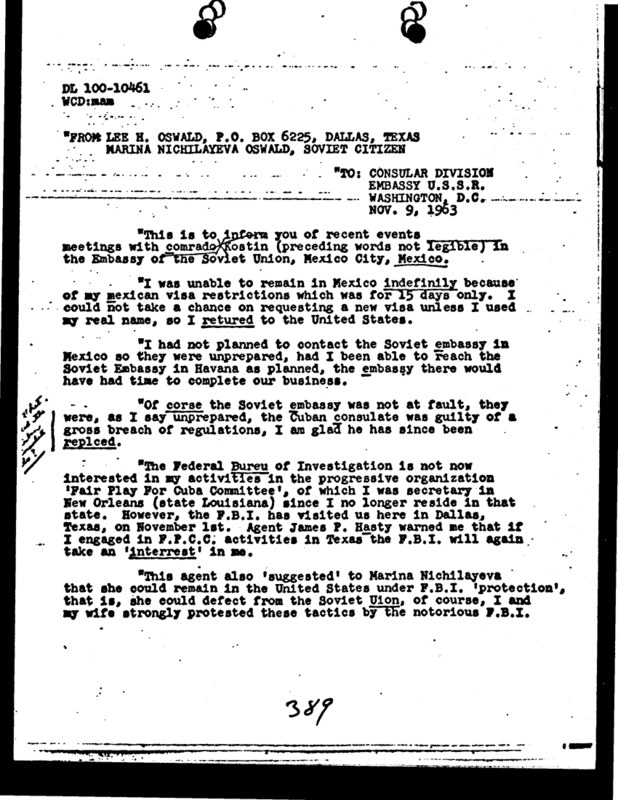 (28) A little over five hours after receiving that cable, Mexico City had found the transcripts of phone calls that seemed to indicate that Oswald had been in the Cuban Embassy based on a conversations between Sylvia Duran and KGB Agent Valerie Kostikov indicating that Oswald had been in both embassies on Friday, September 27th. 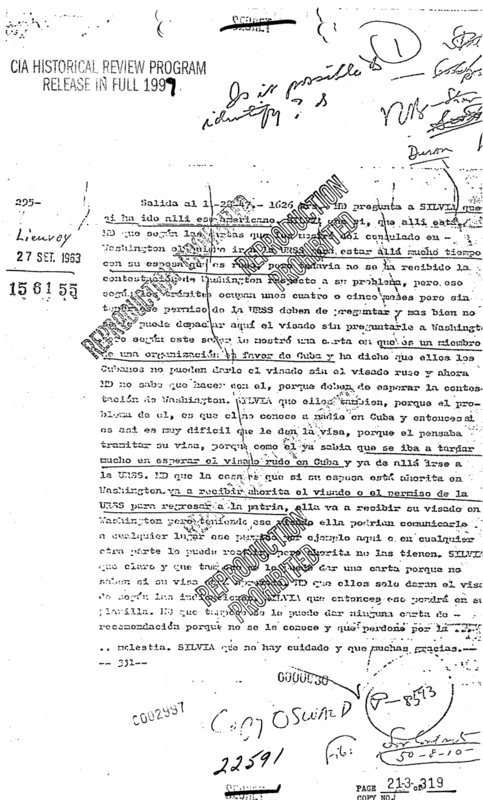 (29) Like a master spy, Angleton confirmed the information in Oswald’s letter about being in the Cuban Embassy without letting Mexico City know he had intelligence about this. More importantly to the CIA, why was Oswald in contact with the head of KGB Assassinations in the region? In Mexico City, Clark Anderson of the FBI was furnished information on November 23 that Lee Harvey Oswald had entered Mexico on September 26, 1963 at Laredo. Clark Anderson was involved in almost all decisions around the investigation being conducted in Mexico City. But the fact that he knew when Oswald crossed the border would also have been reported to Washington and it is perfectly logical that headquarters limited the search to these dates. (30) Ambassador Mann sent a telegram to the Secretary of State at 9:00 PM indicating that they had contacted all US Consular Border posts and requested a search. By the evening shift Mexico City had been informed that Oswald had entered via Laredo on September 26. (31) Win Scott sent a memo indicating that the Laredo Consulate notified the ambassador at 7:00 PM of Oswald’s entry on September 26. (32) The 7:00 AM notes of the Mexico City Station on what they knew on November 24 indicated that they knew exactly the date Oswald entered into Mexico as well. (33) There was no need to expand LIENVOY before this date. Baker continues making her point implying that the CIA Headquarters sent unsolicited information about Oswald to Station Chief Win Scott on October 10, 1963. 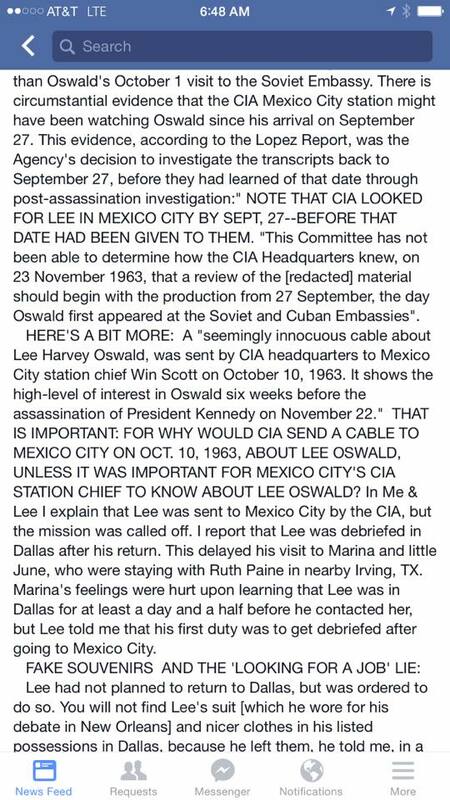 “FOR WHY WOULD CIA SEND A CABLE TO MEXICO CITY ON OCT. 10, 1963, ABOUT LEE OSWALD UNLESS IT WAS IMPORTANT FOR MEXICO CITY’s CIA STATION CHIEF TO KNOW ABOUT LEE OSWALD?” (34) Ms. Baker is historically accurate to stating that headquarters did send information to Win Scott, Chief of Station, Mexico City. (34) CIA Headquarters did not send this cable to Mexico City unsolicited as Baker claims! To fully understand how and why this CABLE was sent, one must look at all of the events prior to it being sent. On September 27, 1963 at 4:05 PM the CIA phone intercept program, LIENVOY intercepted a phone call from Sylvia Duran inside of the Cuban Consulate to the Soviet Embassy. (35) It was this phone call that was finally attributed to Oswald when Mexico City expanded their search to September 27th at the request of Birch O’Neil. The phone call was translated and on the morning of September 28 it was in the hands of Win Scott. The conversation was of immediate interest to Win Scott because, although it did not have a name attached to it, Duran stated that she had an American with her who wanted a travel VISA to get to the Soviet Union. As part of the station protocol, any American or English speaking person that made contact with either the Cuban or the Soviet Embassies were a priority for the station. Scott wrote on the top of the transcripts, “Is it possible to identify?” He wanted to know who the American was. The transcript demonstrates that on September 28, 1963 Win Scott was curious about who the American was inside of the embassy with Duran on Friday, September 27, 1963. (36) The LIENVOY program and it’s operations are well documented in Bill Simpich’s work, State Secret. This operation was one of the most closely guarded secrets. Win Scott, received all of the transcripts every day and read them personally and he was aware that there was an American inside of the Cuban Embassy who had visited the Soviet Embassy. They were not able to take action or link this to Oswald until after the assassination of President Kennedy. The CIA could not do anything about the phone calls of September 27th phone calls because they were phone calls in which no name was identified. It was not until October 1, 1963 that a phone call was made in which the caller used the name “Lee Oswald”. This cable is famous because it contained the photograph of the “Mystery Man” and the description of an individual who was not Oswald. The cable had inaccurately linked the man who made the phone call to the man in the photographs. This cable has provided the fuel to the fire that the “Mystery Man” was impersonating Oswald for years. This cable was sent on October 9, 1963 to headquarters. This cable, MEXI 6453 absolutely proves that Ms. Baker has completely misrepresented the October 10, 1963 Cable in her attempt to prove that the CIA sent Oswald to Mexico City. The highlighted portion of this is used to demonstrate the tracking numbers used by the CIA in their cables. The highlighted portion of this cable indicates that the cable was sent from Mexico City (MEXI) and the number assigned to the cable was 6453. These numbers were specific to cables and were sent in sequential order. The next cable from Mexico City would be 6454. Note the date of the cable is October 9, 1963. The numbers on the cable are very important. It will be used in any and all cables between headquarters about this cable so that it can be referenced. Headquarters responded to this cable with the information about Lee Harvey Oswald. The point is there is absolutely no evidence that headquarters wanted to notify Win Scott about Lee Harvey Oswald’s presence in Mexico City. The October 10th cable that Baker references does not prove that Oswald was working in an operational capacity because it was a response to information sent from Mexico City. When examining the October 10, 1963 it clearly identifies that headquarters is responding to Mexico City with information about Oswald. It is a response, it is not unsolicited as she would have her readers believe. The highlighted section clearly identifies the reference to cable 6453. This is the prime example of how an actual historical document can be used to perpetuate a myth. It is not an accurate portrayal of the historical record that has been so carefully presented by the research of John Newman, Bill Simpich, and Jefferson Morely. All who have painstakingly written great works that explain the CIA operations in Mexico City. While there are issues raised by these cables and their content, it is not remotely fair to the historical record to use these primary sources or to imply that the works of Newman and Morely somehow support the claims she makes in reference to these documents. The facts in this article clearly demonstrate how a little bit of truth has been worked into the Oswald mythology created by Author Judyth Baker. Lee Harvey Oswald visited Mexico City. The CIA in Mexico City was attempting to figure out who he was as of September 28. 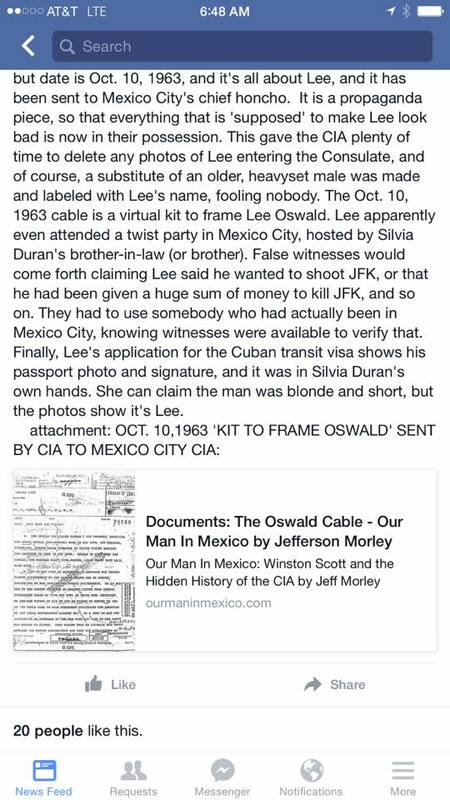 On October 9 there was a cable sent from Mexico City that triggered information about Oswald on October 10 from CIA Headquarters. It was not unsolicited information, as Ms. Baker would have us believe, nor does it prove that he was working in an operational capacity. Five hours after Birch O’Neil, under the direction of James Jesus Angleton expanded the search for information in a cable to Mexico City asking them to start searching on September 27, 1963 for information about Oswald the September 27th transcripts were linked to Oswald. It was information that Lee Harvey Oswald himself had unwittingly provided to the CIA and FBI when he wrote the Russian Embassy in Washington D.C. on November 9, 1963. This letter was intercepted by HTLINGUAL, a program run by James Jesus Angleton. While Ms. Baker is correct that the Lopez report indicated that there was evidence that CIA Headquarters may have had prior knowledge of the trip she fails to mention that the report leaves the door open to leads that came from other sources. The record shows, that there was no knowledge of this information prior to the HTLINGUAL intercepted letter of November 9. 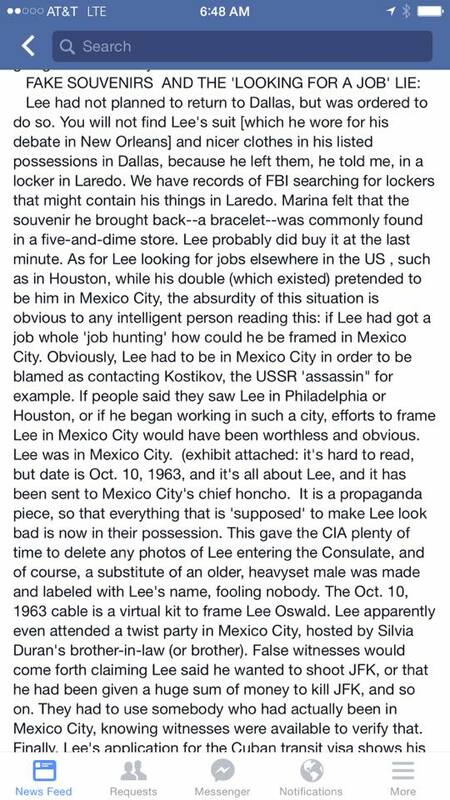 This ends the myth that the Birch O’Neil cable somehow proves that the CIA knew of Lee Harvey Oswald’s trip to Mexico City prior to the trip. The investigation conducted by the CIA after the assassination does not support prior knowledge of Oswald’s visit from an operational sense. Baker has claimed that Oswald was debriefed upon his return. The work of LIOVAL-1 in the year after the assassination does not support this. The CIA would have no reason to be investigating what had transpired in the Soviet Embassy if Oswald had been “debriefed”. It does not support her assertion that they were setting Oswald up with Kostikov to frame him. There would have been no need for further investigation. What the record shows is that they risked the LIOVAL-1 operation, which appears to have been a recruitment operation, to learn what had happened inside of the Soviet Embassy. The record shows, that they were attempting to determine what if any contact had happened with Kostikov. It does not support the Oswald Mythology as told by Judy Baker. Ms. Baker continues to blur the historical record leading people down the path of the Oswald Mythology that she has created. Her continued efforts to support this myth, by including historically accurate information, would lend the casual reader to find her knowledgeable and supported by the historical record. 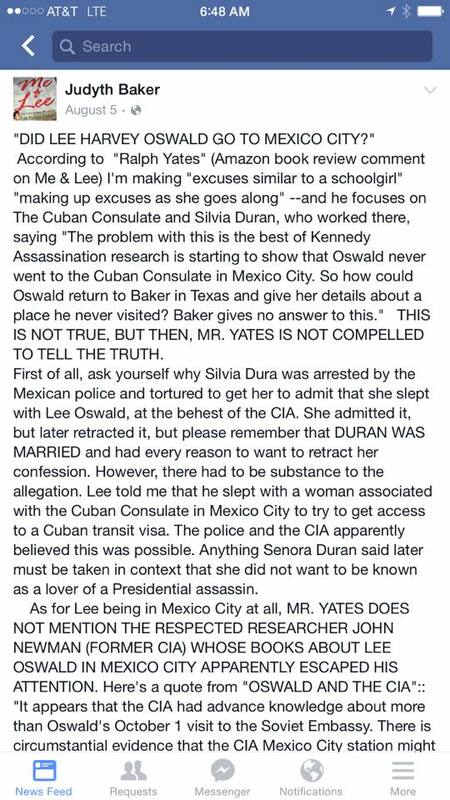 The Oswald Mythology that she wants us to believe has not been accurate about Kerry Thornley, Eric Rogers, Sylvia Duran, and now Oswald’s trip to Mexico City. Sadly, she is becoming one of the main impediments to us gaining access to the truth. Included below the sources is her post of August 5, 2015 as a record of her continued attempts to bolster this mythology at the expense of the truth. A special thanks to Rob Clark and Bill Simpich. Rob’s podcast introduced me to Nochiporenko’s book. Bill Simpich continues to speak with me about the Mexico City operations. Both of you have been tremendous inspirations for my work. (28) NARA Record Number: 1994.05.31.12:51:10:96000 Reel 7, Folder H – SILVIA TIRADO DE DURAN [SOFT FILE]. (32) NARA Record Number: 104-10015-10268 INFORMATION FROM U.S. CONSULATE NUEVO LAREDO CONCERNING LEE HARVEY OSWALD.